This is a great historic cabin with a large living room and a sleeping loft. This cabin was built in the 1940's and was recently upgraded in 2012 to include a custom stairway, new windows, and furnishings! You can relax and enjoy the wood burning fireplace in the living room or sit out on the patio and enjoy the view! This historic cabin is called red arrow because of the interesting red arrow in the outside chimney. 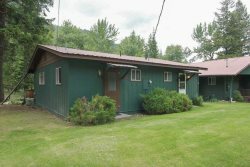 This cabin is in a great location and is a short walk away from the lake! It is near a couple restaurants, miniature golf, the Wallowa Lake Tram, and more! Become a part of history by staying in this neat cabin with your family in one of the most beautiful places in the state! The Eagle Cap wilderness is calling your name!